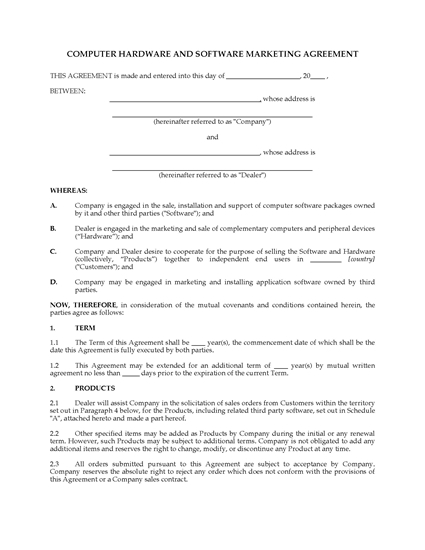 Set up a strategic alliance between a software developer and a computer hardware vendor with this Hardware and Software Marketing Agreement. The parties to the Agreement agree to integrate their respective products and sell them in combination to end users within a specified territory. The computer dealer is given non-exclusive rights to market, promote and sell the software products within the specified territory and to use the developer's trademarks in relation to those activities. 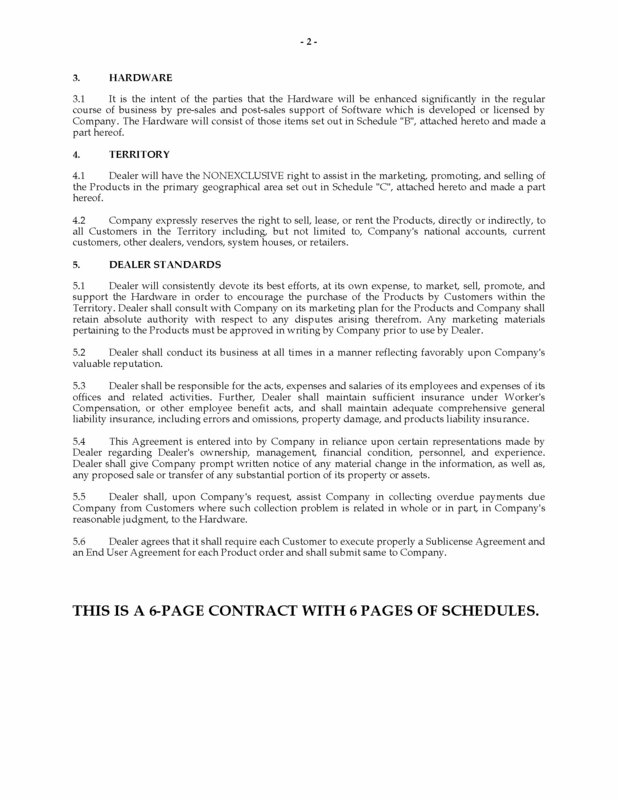 Each customer who purchases hardware from the dealer will be bound by an end user agreement for each software product installed on the computer systems they purchase. The dealer agrees to meet certain sales quotas during the term. The software developer's warranty is limited to repair or replacement of defective software and does not extend to the hardware. There are mutual confidentiality clauses for both parties. The relationship between the parties is that of independent contractors and not partners or joint venturers. 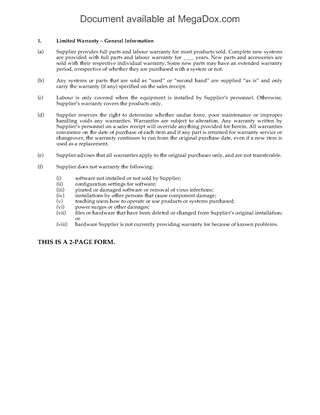 This is a generic legal form that does not contain specific references to the laws and regulations on any particular country. 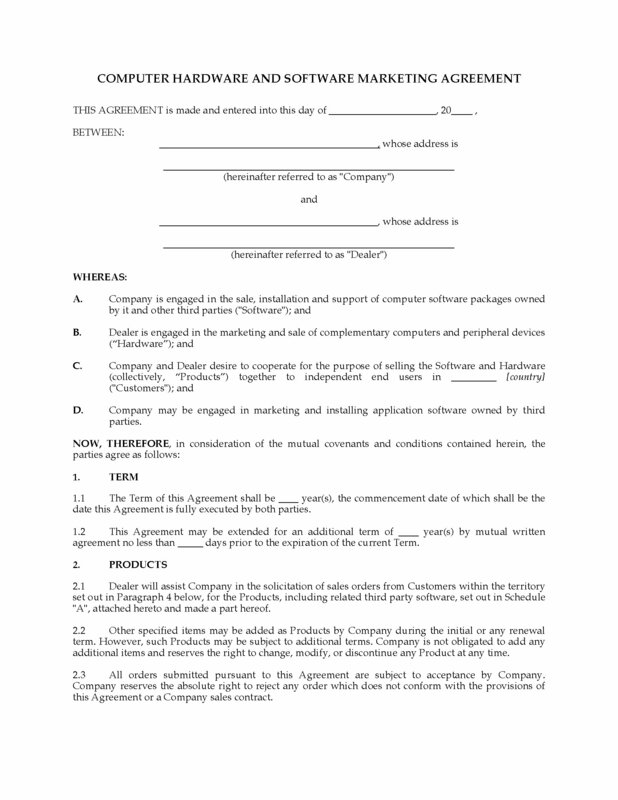 This downloadable template contract can be easily customized to your specifications. Write a Request for Proposal (RFP) for the purchase of an integrated computer system (hardware, software, diagnostic tools) from prospective vendors with this downloadable template. The vendor must supply the source code, system design specifications, and source code escrow agreement. The vendor must accept full responsibility as prime supplier of the computer system. The customer reserves the right to require the vendor's assistance in developing the functional specifications. The prices for the components must be the vendor's most favorable customer pricing. Progress payments will be made upon achieving certain performance milestones, which are tied to the customer's conditional acceptance of the system. The customer may require the vendor to provide financial and performance guarantees. The system will only be accepted after it has passed a series of acceptance tests. The Request for Proposal for Computer System Purchase template can be easily customized to meet your unique needs.